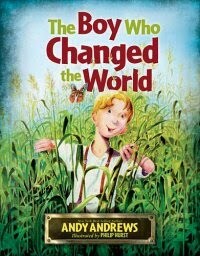 "The Boy Who Changed the World" by Andy Andrew is a children's book with an inspiring and challenging content. It contains historical information about people who literally changed the world – the lives of so many people – through their own little ways. It also inspires its readers to think about their own lives. For a children's book, the effort to communicate the great message is commendable and without the great colored sketches by Philip Hurst I think it won't be very successful in holding the attention of a child, depending also on the story teller. The principles shared from this illustrated children’s book that is a perfect addition to the selection of bedtime story books are not too early for any child to learn about. But personally, I think the story teller, if this is to be used in story-telling, should be dynamic and must use the illustrations perfectly to keep a child’s attention. Over all, I would recommend “The Boy Who Changed the World" by Andy Andrew.